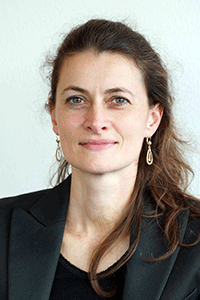 Odile A. van den Heuvel, M.D., Ph.D. Comparing MRI scans from thousands of individuals, researchers have linked obsessive compulsive disorder to certain abnormalities in brain structure. Abnormalities were found in both adult and pediatric patients. A study published in the American Journal of Psychiatry on May 1, 2018 gives researchers new clues into which parts of the brain may be disrupted in people with obsessive-compulsive disorder (OCD). Abnormalities were identified in both pediatric and adult patients. OCD is a common disorder that causes recurring, uncontrollable thoughts and behaviors. Its causes remain poorly understood. Abnormalities in certain information-processing circuits have been implicated, but these do not seem to explain all of its symptoms. The new study is the work of the ENIGMA-OCD consortium, a large international team of researchers who share a research interest in OCD, led by 2009 Young Investigator Odile A. van den Heuvel, M.D., Ph.D., a psychiatrist at VU University Medical Center in Amsterdam, Netherlands. They used MRI scans to compare brain structure in 1,905 people with OCD with that of 1,760 healthy controls. Their study, which used clinical and imaging data from 27 sites worldwide, is the largest analysis to date of the structure of the brain’s cortex in people with OCD. The cortex is the brain’s outermost layer, and the portion that performs its most complex functions, which give rise to memory, attention, perception, cognition, thought, language and emotion. Dr. van den Heuvel and colleagues used the brain scans to create detailed maps of each study participant’s cortex. Comparing these maps, they found that the surface area and thickness of certain regions of the cortex were smaller in people with OCD. Because the study was so large, the team was able to link subtle structural differences to the disorder, something that hasn’t been possible to corroborate in previous smaller studies. In particular, they noted that the parietal lobe—a part of the brain thought to be involved in attention, planning, and response inhibition—was thinner in people with the disorder. These brain functions are often impaired in people with OCD, and such abnormalities might contribute to patients’ recurring thoughts and repetitive behaviors, the team says. The parietal cortex was found to be consistently implicated in both adults and children with OCD. More widespread cortical regions were found to be thinner in medicated adult OCD patients (versus controls), and more pronounced surface area deficits (mainly in frontal regions) were found in medicated pediatric OCD patients (versus controls). Because of the way the study was designed, it’s not possible to determine whether or to what degree medication contributes to changes in patients’ brain structure. That will be the subject of future studies, the team says.